Police in Iceland have a warning for visitors: Beware our roads in the winter. Spending a clear winter night under an Arctic sky lit up by spectacular streaks of colour from the Northern Lights is an often-cited "bucket-list" experience among the reasons more people are visiting Iceland, especially its northern region. The remote region on the edge of the Arctic Circle is one of the best places in the world to spot the colourful phenomenon. But police say many foreign visitors lack the experience and expertise to handle Iceland's wintry road conditions. They are increasingly worried about visitors scanning the sky for the Northern Lights and not looking at the road, which may be icy, twisty or narrow — or all three conditions at once. "The weather in Iceland changes every five minutes, so to speak, and road conditions change accordingly," said superintendent Johannes Sigfusson of the Akureyri Police Department, the largest in the northern region. "In a matter of minutes, a dry road can turn icy and slippery. "The risk is compounded in the middle of the night, when an inexperienced driver is deprived of sleep and with one eye on the sky." The aurora borealis, or Northern Lights, occur when a magnetic solar wind slams into the Earth's magnetic field and causes atoms in the upper atmosphere to glow. The lights appear quite suddenly and the intensity varies — the most amazing are bright green with streaks of purple and yellow. Northern Lights sightings depend on a mix of luck and effort. 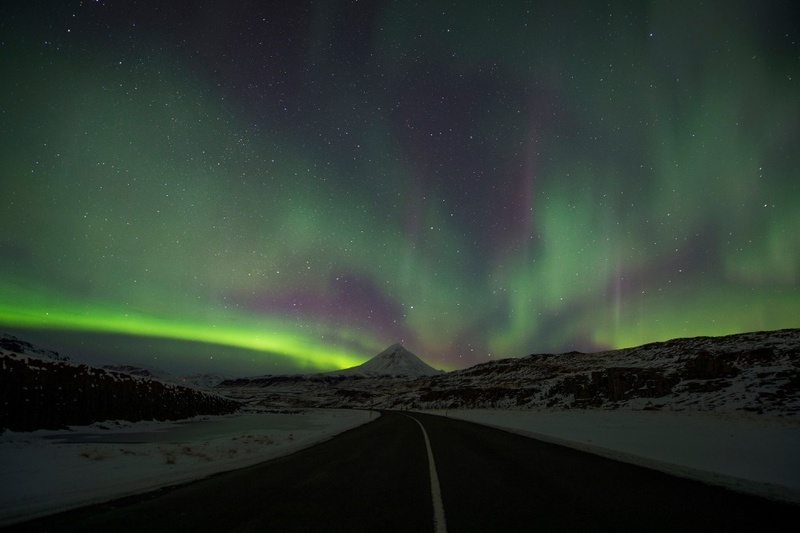 The Icelandic Met Office operates a 9-scale Northern Lights forecast every day, based on solar winds in the past three days, that pinpoints the best spots in the country each night to try to see the lights. But travelling away from city lights is most often necessary, and that has led some drivers to take hazardous mountain roads. It doesn't help that, in Icelandic winters, the sun in Akureyri can rise as late as 11:39 and set as early as 14:43, meaning that tourists are spending most of their day driving in the dark. Iceland's road infrastructure also lags behind its boom in international tourism. The national Road No 1, which runs for 1 337 kilometres as it connects coastal towns and villages on this volcanic island of 350 000 people, still has narrow lanes and many one-lane bridges. Last month, an SUV carrying seven British tourists plunged off a one-lane bridge on Road No 1 in southern Iceland, killing three people and critically injuring the others. "Driving on Icelandic winter roads it is tough. Definitely," said Jeremy Tan, a financier from Singapore who was about driving his rental car half way around Iceland. "Dark roads and strong winds are something that I am not used to." He was parked at Godafoss, a landmark waterfall in northern Iceland, hoping that the clouds might pull the curtains on a winter Northern Lights show. The Icelandic Met Office's Northern Lights forecast for that night listed their strength as "moderate" but Tan was prepared to wait, with warm cloths and snacks for the night. The Chinese Polar Research Institute is opening Iceland's first-ever aurora research station in a remote valley about a half-hour drive from the northern town of Akureyri. The futuristic three-storey building, set to go into operation later this year, is part of China's broad ambitions in the Arctic. "Weather prediction is difficult. Aurora prediction is even more so," he said. "We just have to wait and see, like with the earthquakes."